You know that thing that happens when the world finds out that you sew? You are flooded with requests to sew things. Bless them, right? Everyone means well. Remember those kindergarten chair pockets I made for my son’s class last year? Well, you can probably guess where this is going…at least a little bit. About halfway into this school year J’s first grade teacher approached me about sewing chair pockets for his classroom, just like the ones from last year. Much as I loved making chair pockets for his classroom last year, it is time-consuming and costly (it takes A LOT of fabric). Plus, it seemed inequitable to me. If classrooms need chair pockets is it fair that the only classrooms who get them have my kid in them? Not really. So, I suggested that the school identify how many classrooms need chair pockets and write a grant to cover the cost of store-bought chair pockets. J’s teacher came back and suggested that the ones I make are sturdier than the mass-produced kind. I was terribly flattered. I agreed I could make them and quoted her a price per classroom (at 25 chair pockets per classroom) that paid for my time and supplies. She submitted the grant and it was only after the grant was accepted that I found out that nearly the entire school needed chair pockets, 300 to be exact. 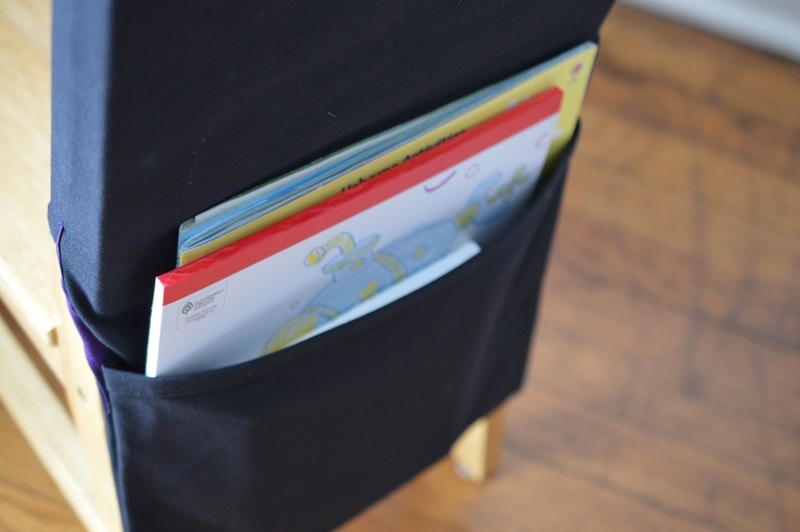 Turns out every first grade and kindergarten classroom except for two needed chair pockets….one of those two classroom has special chairs and the other has the pockets I made last year. Ha! I was totally overwhelmed. 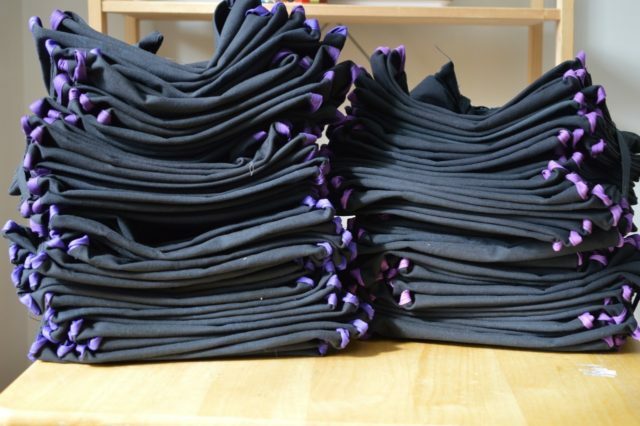 In the end, we decided to use the grant money to purchase store-bought chair pockets for all four first grade classrooms (they wanted deeper pockets and other changes that I couldn’t easily accommodate) and I was responsible for the remaining 100 chair pockets for the kindergarteners. Much more manageable but still a lot. I enlisted the help of my former student and amazing sewist Gigi (just like I did last time) and we got to work. We washed canvas fabric, cut, cut, cut and stitched up these beauties. I ordered my fabric from a local fabric shop that has since gone out of business but if you are looking for something similar I did find this duck canvas for sale of the same fabric weight. I had a sore back for a week after cutting 100 strips of canvas fabric. Never mind the cramp in my neck from sewing. (I’m a weakling when tackling this much canvas, apparently). 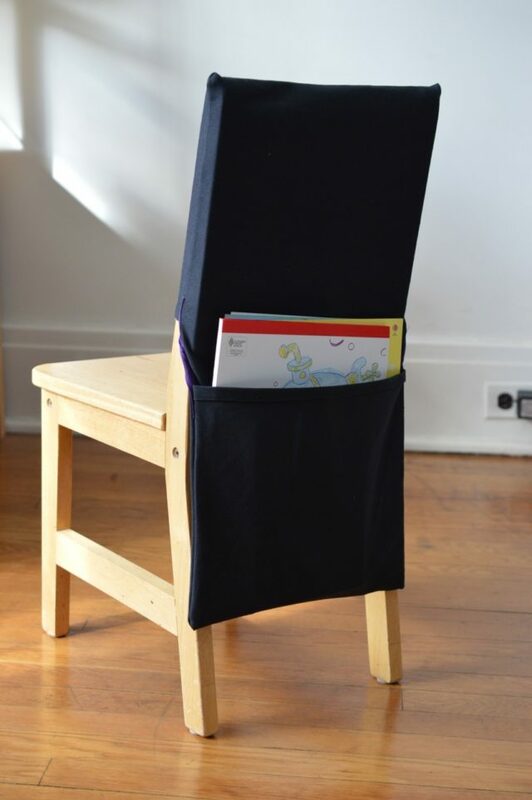 The result of our hard work is 100 sturdy chair pockets. The store-bought chair pockets arrived as well and before we knew it each chair was outfitted. Even bigger than the physical accomplishment, of course, is knowing each kindergarten and first grade classroom is set for years to come. They really need these chair pockets because the kids sit at tables, not desks, so they need a place for their stuff! 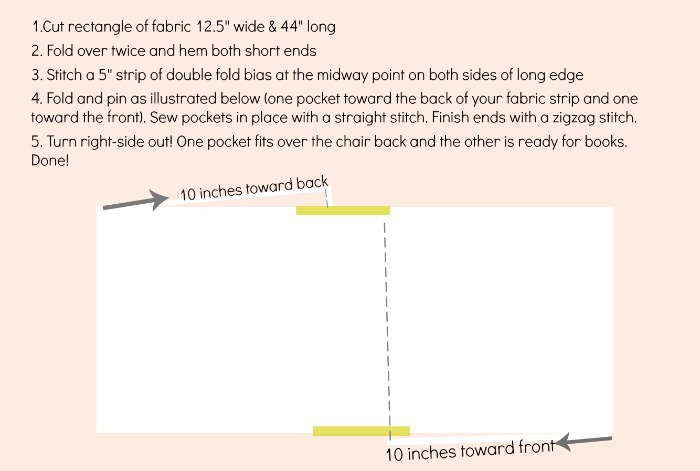 I’ve shared it before, but in case you are interested in making your own chair pockets here is my quick tutorial (they are perfect for homeschoolers since you can just pack them away when they aren’t in use!). It was quite the undertaking but it feels great. This is our family’s last year at this school and it feels pretty good to know these chair pockets will be used for many years to come. Now that the school year is almost over and I’m getting all sentimental, it feels even better. You will never believe what happened next, or maybe you will. I got an email from C’s third grade teacher, she had heard about the chair pockets and was wondering…. That’s right, world! I sew! Note: This post contains affiliate links. This means that when you purchase something after clicking a link on this site, you are supporting my small business. Thanks! I really enjoyed reading about your chair pocket adventure. Yep! My son’s class had Secret Show and Tell so I made drawstring bags…last year…bags again. And now his sweet former teacher asked if I could make chair pockets because the store bought ones really are awful. Their boxes fell out of them repeatedly all year…I know because I subbed in there. So, thanks for the link to the tutorial. I’m sure I’ll be needing it. 🙂 Good for you for using your talents to help out your school. I know it’s appreciated. Yep, this is exactly how it happens! Ha! Have fun with all your making. It was! I’m so lucky to have Gigi help me out. We were the sew-a-thon.